Boqueron River Rafting. Panama City river rafting. 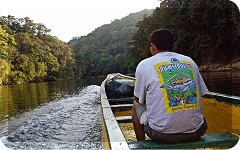 The Boqueron river was pioneered for rafting/kayaking by Adventures Panama in January 1998. 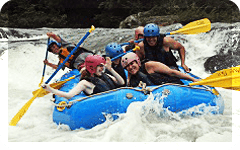 The river is classified as Class II, check white water rafting Panama rapids classification here . There are rapids to have fun with all the family. The main economic activities that surrounds the area are: gold panning, cattle farms, subsistence agriculture, forestry, and banana plantations. Immagine a pool with a mellow current taking you gently is a raft, duckie or kayak through the forest. Well, that is exactly what Boqueron River rafting is all about. Begins by picking up guests at Panama City around 8:00 a.m. We will arrive to the put in location an hour and a half later to start rafting around 9:30 a.m..
We should arrive to the take out zone around 12:30 p.m. and be back to the original pick up place in the city about 2:30 p.m.
WHO CAN GO ? Any person older than 6 years old in good health. WHAT SHOULD YOU TAKE ALONG ? Swimsuit or a pair of shorts for navigating, sneakers or strapped sandals with good soles, a baseball cap, and sun lotion. A set of dry clothes to change for the return trip. Duckies are more demanding..... but so much fun also !. Usually the Boqueron Panama rafting season extends from mid July though mid November.